For Ft. Lauderdale homeowners the one drain cleaning project that they definitely will need a professional plumber for is cleaning the main sewer line. The sewer line is the pipe that connects the city main sewer to your home. If this is clogged all waste backs up. Your toilets, tubs, sinks and washing machine will not drain if the sewer line is obstructed. At that point you have a serious plumbing emergency and you’ll need help now! What are the Signs of a Backed Up Sewer Line. Signs of blockages in the main sewer line typically show up initially in first floor bathrooms because their drains, tub, toilet and sink, are the closest to the line. A toilet that won’t flush or a tub that has standing water are both signs of a backed up sewer line but are not absolute proof. When waste backs up in a tub, you can be fairly certain you have a blockage in the main line. You can confirm this by locating the drain vent outside your home and checking for water. If water or waste is present your sewer line is blocked. What Does it Take to Clear a Sewer Line? For starters you need a trusted plumbing service that has the trained technicians and the proper equipment. The sewer line is a larger pipe than you’ll find in other drains in the house so it will need a larger, usually truck mounted, plumber’s snake to begin clearing the blockage. This snake will be sent down the drain vent which is typically located outside your home but which might be located on your roof if you have an older house. This process will take some time because of the length of the sewer line. If the snake can’t make it through the blockage, the plumber can send down a camera to determine just what and where the blockage is. If the clogging is due to roots, a root cutter can be attached to the snake to cut through. If the camera reveals a crack that has allowed dirt and debris in, the only option is to dig up the yard, cut out the bad pipe and replace it. 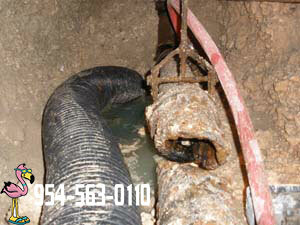 Sewer line drain cleaning can be a tricky business. If you think you have that problem, give us a call and we will send a technician to assess the problem and give you your options.